A closing artist roundtable for the GTU Library exhibition "A View for the Bench" will take place on Thursday, September 20, from 5:30 to 7:30 pm in the GTU Dinner Board Room. The first half of the event will show the film Cruz Reynoso: Sowing the Seeds of Justice with film maker Abby Ginzberg in attendance. The second half of the event will be an artist round table with artists including Malaquias Montoya whose work is on display in the exhibition. All are welcome to attend. “View from the Bench: Social Justice in Art, Law, and Religion of the Chicano Community” features a selection of drawings by Cruz Reynoso on his case notes while he served on the California State Supreme Court, as well as works by other Chicano artists. 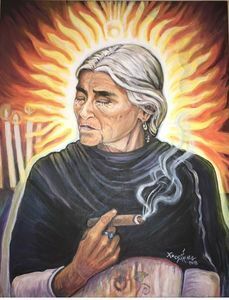 Rather than artists hiding their faith tradition, the Chicano community creates art about protest and social justice, which is fundamentally rooted in the community’s faith tradition. Encompassing the back walls on level one and two, as well as the 36 display cases centered around artist Stephen De Staebler’s Winged Figure, the exhibit will be on display until September 21.